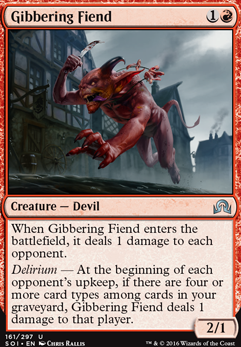 When Gibbering Fiend enters the battlefield, it deals 1 damage to each opponent. Delirium — At the beginning of each opponent's upkeep, if there are four or more card types among cards in your graveyard, Gibbering Fiend deals 1 damage to that player. 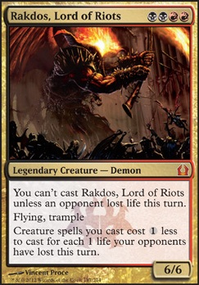 To make the best use of lord of riots you'll need stuff that inflicts damage to your opponents. An average deck will have around 22-26 lands. The amount depending on how your mana-curve balances out. In your deck, you have 11 1-drops and 10 4-drop with absolutely no 2-drops inbetween. You should try and balance out your mana curve more. For starters you could switch out the 4x Forge Devil for 4x Gibbering Fiend. They're only 1 more mana, burn the opponent for the same amount of damage, they don't burn you, have 2 Power instead of 1 and also have a Delirium ability. 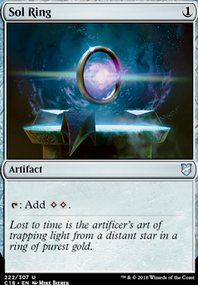 Not to mention it'll help balance out your mana curve more by having a few 2-drop spells. I'd also suggest removing 1x Dance with Devils and 1xImpetuous Devils and add 2x more Vexing Devil. Otherwise, you'll end up with too many 4-drop spells and you won't be able to cast any of them if you don't have enough mana. Hope this comment kind of helps as a guideline on how to make your deck synergize better. Why are you thinking about removing the Hellkite? Is it the high CMC? 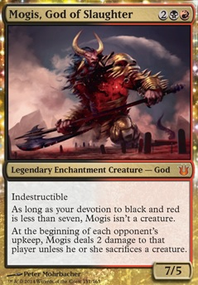 Other lower CMC options that do similar things include the following: Gibbering Fiend, Keldon Marauders, Impact Tremors, Forgeborn Oreads, Keldon Champion, Foundry Champion, Blind Hunter, Bloodhunter Bat, Dakmor Ghoul, Grim Guardian, Pierce Strider, Purphoros, God of the Forge, and Outpost Siege. Personally, I think Gibbering Fiend and Keldon Marauders are the best. 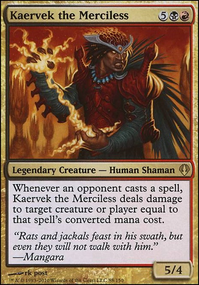 They're super low CMC, so you can play them much earlier in the game and start pinging the opponent for more damage sooner. Invader Parasite is another option, if you don't mind not having any friends. Just make sure you don't accidentally exile all of your own lands, too. Yesterday on What's your deepest, darkest desire? To get help the Delirium active for Gibbering Fiend (or just anyway), you might want to include a Sin Prodder or a Blighted Gorge. At this Point where the deck is right now, I would cut Thermo-Alchemist, which I like, Nettle Drone Forgeborn Oreads and probably Curse of the Pierced Heart, as well as Basilica Guards ... I see the value in the last both cards in this deck, but I think there are better options to fill there spots. Hihi: Devil token could be fun as well like Devils' Playground, Dance with Devils, or Make Mischief... But actually all this spells are expensive... But having one or two copies of Devils' Playground in your deck can be mean with all the Impact Tremors and Panharmonicon. Took about 10 minutes to put this together. When creating a deck with a tribe theme you want to try to stick to one tribe. IE Devils or demons. I chose devils to give you an idea of having your deck work together. Now even though all these cards do the same thing in a sense it doesnt mean itll make a great deck However if you team these cards with some decent burn cards Like Lightning Bolt , Lava Spike , Rift Bolt use your creatures to attack aggressively and die and so on and forget the X cost burn the payout isnt that great unless its a finisher like you need to deal 6 more and have the mana but if its countered youre all tapped out so keep that in mind.